my addition: one onion, sliced and quartered. 1. Preheat the oven to 400*. Cook whole potatoes in boiling water for 15 minutes. Drain and cool slightly. Peel the potatoes and cut into thin slices. 2. Brush the base and sides of a shallow rectangular ovenproof dish with some of the oil. 3. 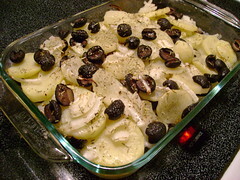 Layer the poatoes with the rosemary, cheese (or not), olives and onions. Drizzle with the remaining oil and pour over the stock. Season with salt and pepper. 4. Cook for 35 minutes, covering with foil to prevent the potatoes from getting too brown. Serve hot, straight from the dish.